Economic times being what they are, we decided to dine at home and go out for pie. That is how the search for New Jersey's greatest cherry pie began. Our lazy summertime efforts at pie reporting led us into the great wild yonder of Jersey farmer's markets, where baked goodies take a back seat to grown goods. Having recently read with (unexpected) interest the succotash recipe in the Joy of Cooking, Jersey Pie found ourselves at Melick's farm stand, face to face with fresh, local lima beans. Had we known that they grew in big, fuzzy, friendly pods? Enamored, we shucked and jived all the way from Oldwick to Jersey City, east on I-78, releasing those gorgeous legumes from their pods while listening to a Michael Jackson tribute on the radio. Now, having tasted the genuine article, we would argue that a canned lima bean is an altogether different thing, and we champion any five-year-old shuckin and jivin before a plate of those pale, tasteless beans. We brought home the fresh corn as well and an enormous red and yellow heirloom tomato to eat in slices with salt and pepper. And peaches. Melick's peaches may be the best in New Jersey. While selecting corn in our cleavage-revealing summer top, we were told this by a nice gentleman who was leaning over, choosing his corn. Unsure of whether his true subject of interest was cleavage or peaches, we are withholding our opinion, and jokingly refer to the reviewer as "Mr. Cornpeaches." Our supper of succotash and tomato was delicious. However, we have to confess that we suffered from the succotash and will henceforth substitute lowfat milk for the rich, reduced cream the recipe calls for. And yes we had a pie. Ladies and Gentlemen, we have a winner. 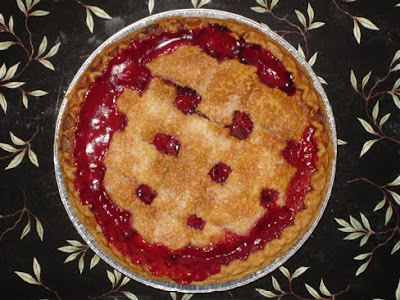 Melick's woven-lattice cherry pie is very, very good. The crust, oh, the crust, it was perfect. Crust is so important, as it rescues the sweetness of those jubilant cherries from falling headlong into sour or cloying. If we could convince our local diners to order their pies from Melick's, our cherry pie troubles would all be over. But Melick's charges a tad more than a pretty penny to transport their pies. Nota bene the mark-up you pay for buying your cherry pie at the Hoboken Farmer's Market, where HALF a pie sells for ELEVEN dollars! Sorry, but half of even a Melick's pie, even with its flaky pastry crust sprinkled with delightful sugar crystals, even with its tart Michigan cherries, even with its perfect fruit to crust ratio that allows even a sliver of pie to have a fruit filling, is not worth ELEVEN dollars!! We could not, would not, never will pay it. While we've enjoyed our trips to the hinterland of Jersey for alternative pie sources, our quest is for a good old slice of pie and cup of Joe at a local eatery, so don't un-follow Jersey Pie yet. We will return to our diner-diving ways once the farm stands close, some time in the autumn. If you prefer our ranting and raving (about the poor local choices) to our engorged, ecstatic prose (about the farmer's markets) ... we'll be back. In addition, we have a first, a guest blogger who recently sampled the pie at Matthew's Colonial Diner in Waldwick, so check back soon! 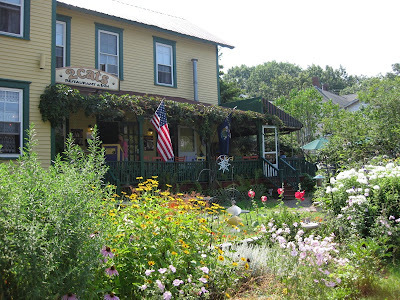 If you find yourself within 2 states of Maine, you owe it to yourself to have breakfast at 2 Cats in Bar Harbor. Our meal was ludicrously delicious. It began with a mug of Equal Exchange coffee, then purred into a Summer Scramble: eggs, tomatoes, onions, and herbs grown on the premises. Spicy home fries and fresh baked bread with a garnish of cantaloupe and kiwi completed the plate, but don't let us forget the butter. Butter you say? Yes, the butter. Strawberry butter. That's what we're talkin' about. The service was as nourishing as the meal, superb. After breakfast, if you still feel worthy, if the heights of excellence attained by your 2 Cats breakfast haven't blown you completely away, roll out onto US Route 1 heading south, and just about lunch time you will be in Waldboro, where really, oh, yes, really, you should pull off the road at Moody's Diner. If 2 Cats is ludicrously delicious, Moody's is insane. You will want to ravage yourself, dress up in a monkey suit, run down the highway shouting, "this is what life is supposed to be like," and then fall down in a heap weeping when you taste that PIE. We set the stage with a CheeLT, (That's a cheese, lettuce, and tomato sandwich.) a bowl of home made corn chowder, and a home made biscuit. Yum. While we ate, the waitress walked by with a tray of pies for a table of six nearby. She did so casually, not at all telegraphing the superlative bounty she controlled. But we could hear those little slices giggling and singing. They know what they are: fresh, sweet, and made to please from recipes handed down through generations of pride and love. Maine is a blueberry pie state, not a cherry pie state. Moody's does not bake a cherry pie. So, to honor Maine we ordered the blueberry, and to honor our friend P--also a recent commenter on Jersey Pie, and the painter of our beautiful logo--we ordered lemon meringue. Let's start with the meringue, the perfect, toasted-marshmellow-tan peaks, the white, fluffy, angel-flounce dream waves of sweet whipped fantasy puff, the melt-in-your-mouth goodness. And then, let's move onto the lemon, the vivacious, assertive, easter-yellow sweet and sour counterpoint to the diaphanous paradox that is meringue. Of course, you already know the crust is simple, flour-butter-and-salt perfection. And now the fruit pie. First we observe that it is juicy. Its juice is running out over the crust onto the plate, the deep, purple-blue life blood of the blueberry is freeing itself exuberantly. There is little or no thickening agent in evidence. (Hello, New Jersey.) And there are scores and scores of the relatively smallish Maine blueberries packed into their perfect crust. It is a FRUIT pie. It is a serving of fruit delightfully presented as pie--how clever!--and we would like to say, thank you. Or, oh?! (interrobang) maybe that is what fruit pie is supposed to be?! Ah, to sit at the table of a cook whose mission is to nourish your body and delight your senses. Reader, you simply must... every chance you get.